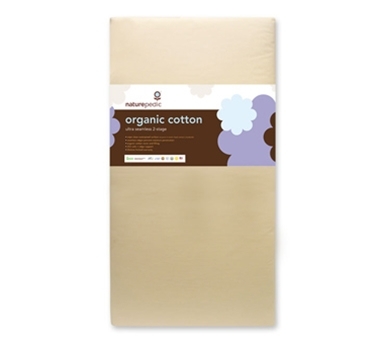 The Organic Cotton Ultra 252 Seamless 2-Stage will grow with your child for many years while providing a more natural, healthy and comfortable sleep environment. With a stronger more luxurious organic cotton cover, seamless waterproof edges, 2-stage dual firmness, 252 coils, edge support, organic cotton throughout, and a firm easy-to-clean non-toxic waterproof surface, the Organic Cotton Ultra 252 is an excellent choice for parents seeking to eliminate potentially harmful chemicals and allergens. It is GOTS certified organic, and was produced in a factory that meets the strictest GREENGUARD® certification standards for eliminating chemical emissions.